On 29 December 1170, four knights loyal to King Henry II of England murdered Thomas Becket, Archbishop of Canterbury, in the city’s cathedral. More than eight centuries later, a bone fragment believed to be from Becket’s elbow was temporarily brought from Esztergom Basilica in Hungary, where it had been kept for centuries, to the site of his assassination. Henry II appointed Becket Archbishop of Canterbury in 1161 because he wanted an ally in his disputes with the church. But, by the end of the decade, Becket had become overly pious, wearing a sackcloth shirt, consuming only bread and water, spurning riches and staunchly defending the faith. The poet T. S. Eliot explored that transformation in his play Murder in the Cathedral, first performed in the Chapter House of Canterbury Cathedral on 19 June 1935. On 29 December, four knights entered Canterbury Cathedral and hacked Becket to death in front of the high altar. Edward Grim, a monk, observed the attack from a hiding place and later wrote down what he saw. Two years later Becket was canonised and his shrine began attracting pilgrims from across Europe. Becket’s martyrdom is depicted in the mid-13th century Carrow Psalter, held at the Walters Art Museum in Baltimore, Maryland. In 1220 Becket was reburied and relics from his body, said to bring about miracles, were dispersed across Europe, with part of his elbow ending up in Esztergom. Three centuries later, during the Reformation, Henry VIII – upstaged by the cult of St Thomas – ordered his shrine to be destroyed and his remains obliterated. On its recent journey, the fragment of Becket’s miraculous elbow was temporarily reunited with a piece of his skull – kept at Stonyhurst College in northern England – before stopping at Rochester Cathedral and Canterbury Cathedral. It was then returned to Hungary. Eliot’s verse drama Murder in the Cathedral was commissioned for the 1935 Canterbury Festival. Eliot must have read Edward Grim’s eyewitness account of the murder, since he uses some its language in his play. In 1953, the Old Vic Theatre in London invited one of Britain’s finest actors, Robert Donat, to play the part of Becket in a new production directed by Robert Helpmann. It was an enormous challenge for the ailing actor, who had long suffered from crippling bouts of asthma and who would die five years later from a brain tumour after collapsing on the set of The Inn of the Sixth Happiness. “They know and do not know, what it is to act or suffer. By Philip Lee, at whose excellent blog Quintessential Ruminations this piece was originally published. We’d like to thank Philip for giving permission to re-publish his article here. The great actor, Robert Donat, who died too young in 1958, made only 20 films in his lifetime because of his chronic asthma. But what films! Speaking of his need for variety in his work, he said ‘I like my pickles mixed’ and they certainly were. They include: The Ghost Goes West, as a Scottish laird and a ghost (1936), The Inn of the Sixth Happiness as a Mandarin (1958 – his last film, in which he spoke the prophetic lines, ‘It is time to go, old friends. We shall not see each other again, I think.’), The Private Life of Henry VIII (1933) as Thomas Culpepper, sophisticated Richard Hannay in The 39 Steps (1935), Edmond Dantes in The Count of Monte Cristo (1934), Sir Robert Morton in The Winslow Boy (1948), a Scottish doctor in The Citadel (1938), for which he was Oscar nominated, and the eponymous teacher in Goodbye, Mr Chips, playing him both as a young man and as an 83 year old, and stealing the 1939 Oscar from Clark Gable as Rhett Butler in Gone with the Wind (which had taken all the other awards that year!). An unknown young actor: called Robert Donat. An unknown young actress: called Flora Robson. An unknown young director: called Tyrone Guthrie. An unknown undergraduate: called Alistair Cooke!!! ‘I would almost say that the best screen actor is the man who can do nothing extremely well.’ (Alfred Hitchcock – Footnotes to the Film). Well, Robert Donat certainly does it extremely well, but it’s a sleight of hand worthy of Hitchcock. It is not ‘nothing’ – it is the surface calm of a man who is seething underneath with thoughts and needs. Directors often do not have a great understanding of the acting process and, in a desire to stop an actor ‘showing’ and thereby ‘overacting’, they ask them to ‘do less’, misunderstanding that it is not about doing less but about being real. The ‘doing nothing’ is what happens – like life – in the moment. (When we don’t want others to read our thoughts or can convey what we want by merely a glance or, because our thoughts are driving underneath, we allow words to simply ‘fall out’ of our mouths, our faces give little away.) But this seemingly effortless work – like the propulsion of a swan’s webbed feet beneath the surface of the water while it glides elegantly above – involves a deep preparation beforehand. In his article Film Acting in Footnotes to the Film, Robert Donat takes as an example a single moment of surprise, and lists what the actor needs to imagine: a) the mental state b) the emotional state of the character at the moment of the surprise c) the nature of the surprise d) the degree of mental and emotional state and e) thinking backwards and forwards in continuity to ‘place’ the acting in proper sequence, size and shape. These are all conscious decisions (‘though very nearly instinctive in a good actor’) but, in the moment of putting this work onto screen, Donat says it must be ‘unconscious’ – in other words, as the actor places himself into the moment – it will be ‘the real thing’. Donat is the master of the cool exterior whilst his mind races with possibilities. Watch the interrogation scene from The Winslow Boy (1948). Here, we see the man’s humanity and warmth in his eyes, even whilst he is fiercely grilling the young suspect. But he never gives away what he thinks until the end of the interview, surprising the other characters – and us. The grilling starts gently, to win the boy’s confidence. (Notice the difference in energy and strength between his remarks to the boy and to the father’s interruptions.) As he becomes more sure of the boy’s innocence, he becomes harsher and harder to test him, and to simulate the cross-examination he knows his young client will have to endure, until he reduces him to tears. During this section, his eyes never leave the child’s face, searching out the truth, and yet we see in them, wry amusement at some of the answers. Donat’s eyes (unlike the child who is good but always ‘on text’) are fully alive and he really listens, really watches. Look at his use of props. Donat plays with his glove but becomes very still when he needs to know an answer. His cane becomes both a symbol of his position and a means to provide a physical anchor for the scene. He is centred, upright, taking all the power from his centre. His face is relaxed even at the strongest moments. Nothing is pushed or forced. Donat’s role, Sir Robert, is accused by the boy’s sister of never letting anyone know the truth about him and of being ashamed of his emotions. Sir Robert says that in his profession he needs ‘cold, hard logic’. So when, in the film, emotion does erupt, it is in spite of himself. Donat never indulges his feelings but plays the man who has spent a lifetime concealing them and his affections, which are never revealed until the last line of the movie. Only watch this clip, with its marvellous last moment, if you’ve already seen the film, as you should watch it all! In Goodbye, Mr Chips (1939), we see the reverse reasons for this hiding of the emotions. The shy, sensitive Mr. Chipping wants so much to say what he feels but cannot because of his insecurity, until it is wrenched out of him by the emotion of parting with his loved one. See how different his physicality is from the last clip, the sternum slightly collapsed, hands in pockets, the rolling walk. He makes his place in the world smaller. Whereas Sir Robert in The Winslow Boy expanded to fill the room and become the central pivot of it, Mr. Chips tries to fade into the background and avoid becoming the centre of anyone’s attention. As he sees the love of his life off on her train, he hardly looks at her, not daring to meet her eyes or say the secret that is in his heart – dying to speak his feelings, but unable to give voice to them. At the last moment he tries, but his courage fails when the whistle blows and interrupts him, and he cannot sustain his bravery to push the moment through. She kisses him and instantly releases him from the self-consciousness that binds him. He runs in a burst of energy and bravery and crumples again as the train leaves and panic sets in. His friend resolves it and fills him with a joy that is hard for him to comprehend. We understand all these complex feelings that are bubbling underneath the surface of the character in a couple of minutes of screen time. We understand it through the actor’s body. 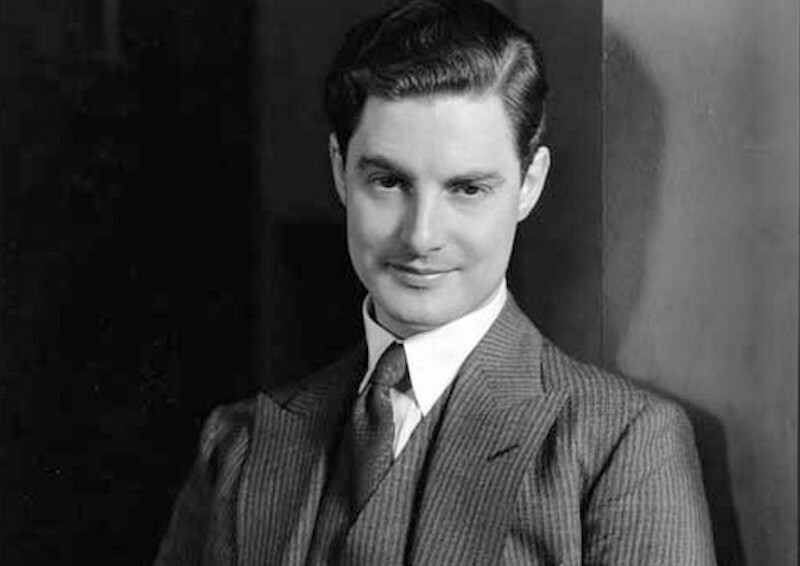 It is so clear here that Robert Donat is totally connected, body and mind. He is a very physical actor whose whole self is immersed in his role’s life, thought-patterns and needs. As Mr. Chips is released from his self-doubt by love and marriage, he is at last able to show his emotions. And the ending, as the old Mr Chips (Donat playing 83 at aged 34! ), is a classic, genuine tear-jerker. In his last moments of the film, the elderly retired schoolmaster makes friends with the homesick new boy at the school and soon afterwards dies, thinking of his thousands of ‘children’. It would be so easy to fall into sentimentality here, but Donat is always firm and true. With his strength faltering as he slips into death, he speaks, with warmth and love in his eyes, practically, truthfully and in a major key, without a trace of self-pity. Donat is superb as the worldly – and dashing – Richard Hannay, who gets caught up in espionage due to a case of mistaken identity and has to use skill and ingenuity to outwit his wicked opponents. With his jaunty moustache and well-cut suits, he exudes urbane intelligence and charm and there is real chemistry between him and Madeleine Carroll. At around 1.02.00 you will find the night in the country inn where they are handcuffed together. This is a very funny scene, with Donat convincing the romantic-natured landlady that they are, ‘so terribly in love’. It also has a potentially sexually charged moment, made physically amusing by the situation of the handcuffs, when Donat helps Carroll to remove her stockings. Yet again, beneath all the teasing, tough talk and tall tales, we see Donat’s eyes twinkling and his generosity as an actor. He is always playing the scene with her, not indulging himself, but watching and responding to every nuance of the moment. In the earlier scene at 29.10 between him and the luminous young Peggy Ashcroft as the crofter’s wife (a rare moment of her on screen), we see real moments of tenderness from him as she protects him from her bullying husband. Again, Donat’s whole physicality is used to the utmost, and often to comic effect, in this action-packed film in which he is always self-assured, but never pompous. And, as always, the teamwork with his fellow actors is perfect. Robert Donat’s soul is still there for all to see who watch his films. Thank you very much to Julie/jigsmave for permission to include this video. © Mel Churcher, all rights reserved.